If you’re a fan of Marvel Strike Force (Free), you’ve undoubtedly noticed that it keeps things mostly within the Marvel Cinematic Universe in terms of character selection. That is to say that the heroes and villains are primarily inspired by the ones you see on TV and in movies and not as much by the comics. Still, the presence of Wolverine means they aren’t limited to just Marvel Studios fare, and the arrival of Deadpool and Cable just in time for Deadpool 2 could kick down the doors for more just as assuredly as the Merc with a Mouth kicks down the fourth wall. Indeed, there isn’t even any waiting for Deadpool because he’s already here. In fact, if you load up Marvel Strike Force right now, he’s literally everywhere, taking over all the spots in the game’s loading screen, which is a very Deadpool thing to do. You can add Deadpool to your team now, though you need to assume responsibility for your actions if you do. He is not a Blaster, which is a bit odd considering that only Frank Castle loves guns more among Marvel heroes, but is instead a brawler with a Dual Pistols basic attack that can do bonus follow-up attacks and a Bounty Hunter ability that lets him ignore Taunts. 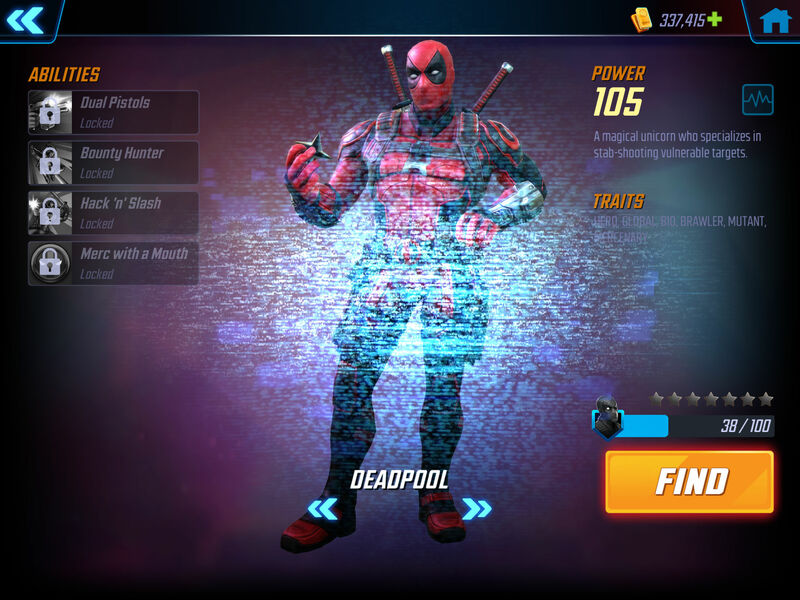 Hack ‘N’ Slash can chain damage to multiple targets, and since he’s notoriously hard to kill, Deadpool’s final ability can revive him and heal him depending on how many debuffs he has at any given time. Even more delightful is the way that FoxNext Games is introducing Deadpool in the following trailer. It’s a tale told by the long-suffering (relatively speaking, for a game that’s only been out for a few months) S.H.I.E.L.D. Medic, as he explains that Deadpool has been catfishing him for months. So how can you add Deadpool to your roster? Right now, there’s just one way, which is to acquire Deadpool Orb Fragments playing through the Merc with a Mouth event. Like other character-focused events before it, there’s a decent chance it’s not going to give you quite enough fragments to unlock Deadpool, but there will be another way in just a few days (this Friday, May 18, to be exact), when raids will also open up so you can win your way to more Deadpool Orb Fragments. The currency to start the raids will be chimichangas, because of course it will. Finally, even though Deadpool himself would not be crazy about us doing so, we should also mention that Cable is on the way to Marvel Strike Force to play cyborg straight man to Wade Wilson’s zaniness. Cable arrives on Thursday, May 24, giving you a little bit more than a week to get comfortable with Deadpool in the meantime. But not too comfortable, or else you’re playing right into his trap.